Below are excerpts from new interviews with Lotte Verbeek, David Berry, and executive producer Toni Graphia. Be sure to click on the links to read the full interviews. Since these posts/interviews follow the latest episode, beware of spoilers for the current and future episodes. In Sunday’s episode of Outlander, a horrified Claire (Caitriona Balfe) watches as scores of caged black slaves are auctioned off to the highest bidder. She risks her own safety by attempting to bring an end to the despicable practice but winds up getting a slave of her own as an uncomfortable way to resolve the conflict. 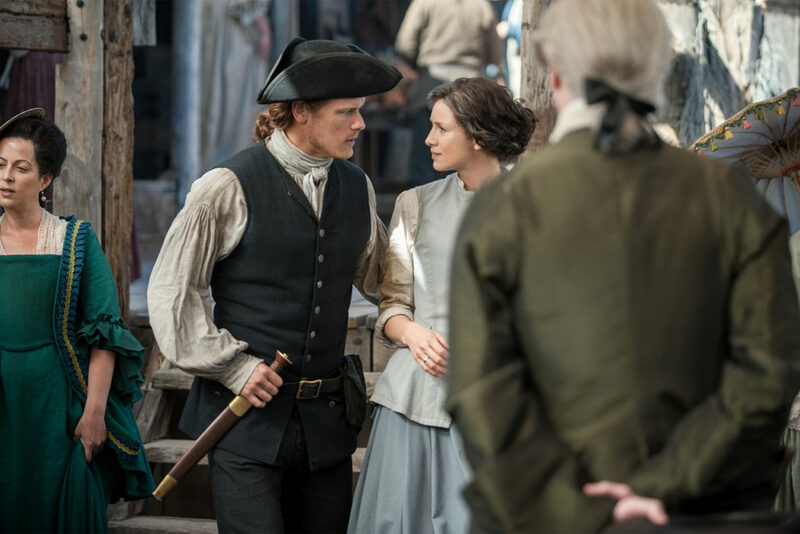 Rather than tip-toe around the subject in an effort to be sensitive, executive producer Toni Graphia told Outlander Live! on Monday that the writers always knew they would include the upsetting scene from Voyager, the third book in Diana Gabaldon’s best-selling series. ENTERTAINMENT WEEKLY: What was that literal blood bath like? LOTTE VERBEEK: They warmed it up to body temperature. After a couple of takes my skin was getting really red and my face as well, because it really warms you up. It was also really slippery, which made it tricky to get out of the tub without falling flat on my face and then walk toward Young Ian in this predatorily foreboding way.I would just try and not fall and slip. But I just had an amazing time because it was a really interesting concept, this combination of eerie and beauty. And I’ve never seen somebody completely covered in blood. It was interesting to look at the patterns on my skin and how it progressed as I walked out of it. Yeah, totally. That was a big change for me. I don’t believe so much in good and evil. I feel like we all have opposing forces within ourselves, and Geillis is exactly that. We know that she’s killed her husband, but we never really see her do the act of killing. So I think in a way, that helped the audience to relate to her, or to at least believe her. But in this season, all of a sudden she’s killing these young boys. And she’s bathing in the blood that she says is goat’s blood. But maybe it’s from the young boys. And so, all of a sudden it’s a bigger challenge to get people to [relate to] me. This sequence, she’s just gone nuts, like time has played a toll and now she’s actually kind of losing her s— a little bit. ENTERTAINMENT WEEKLY: Before we talk about your work this season, did you ever have a chance to read Voyager prior to filming? DAVID BERRY: I did not. I would have had to be the world’s quickest speed-reader because, as I recall, I did the audition and then the next thing I was on a plane. The only thing I could do was cram my lines. I wasn’t completely familiar with all the words I was saying. I was saying stuff about Helwater and stuff and not really knowing the import of that. Let’s talk about doing those scenes with Caitriona Balfe and Sam Heughan at the ball in Sunday’s episode. We were interested in trying to go at the love triangle — at least, I was trying to inject a bit of that tension. On set, we kind of mocked it or at least tried to in a very playful way, this sort of cattiness that these two might have had [over Jamie]. It was quite funny. There are definitely tensions running high, and when Lord John Grey first sees Claire, it’s a moment of absolute shock. But in Lord John fashion, he has to protect himself from being seen. There is sort of an awkward moment between all three of them. Even though Gillian appeared in Season 2, this is the first time we’ve seen Geillis since Season 1. Did you enjoy the opportunity to show how she’s changed in the 20 years since we last encountered her? In the book, she’s gained quite a lot of weight having been on the island for a while. When I offered [to gain weight], they had no interest, but they still wanted to show some transformation, so they used a grey wig and some prosthetics to age me. The blood, obviously, is used to explain how she still looks relatively good for a 50-year-old. I liked seeing the journey for this woman who is so driven to fight for her cause after all these years, but is also getting quite tired and annoyed. I like those bits where she’s not having it anymore, because it has been 20 years! I’ve enjoyed this season the most so far; I think I got some really juicy moments to act. It does feel like she’s being less careful about trying to fit into the past. The fact that she’s making references to 20th-century things like Casablanca and Benjamin Button indicate she’s letting her mask slip. Yeah, completely. She’s one of the most powerful people on this island, and doesn’t have anything to fear, so she’s kind of letting go a little bit. It’s fun to play that. I got the sense that she must be exhausted and so done. She’s not giving up, but she’s reaching that point. In the first season, she was more invested in being charming. After all these years, she’s letting her mask down in public. Do you think of Gillian and Geillis as being different people? Or is Geillis an extension of who she was as Gillian? I think it’s an extension. She’s definitely chameleonic in that she adapts to her environment and her time. She also travels deliberately to the 18th century, so there’s an awareness of how things would be. Geillis has always been someone to explore the boundaries of what would fit and what wouldn’t fit, but I definitely think she is always the same person. The one thread in all these times and places is that she’s fighting for this cause. Even when she’s far away in Jamaica, she’s still fighting for the Scottish cause. This entry was posted in David Berry, Interviews, Lotte Verbeek, Toni Graphia and tagged David Berry, Interviews, Lotte Verbeek, Season 3, Season Three, The Bakra, Toni Graphia by Stephanie Bertone. Bookmark the permalink.